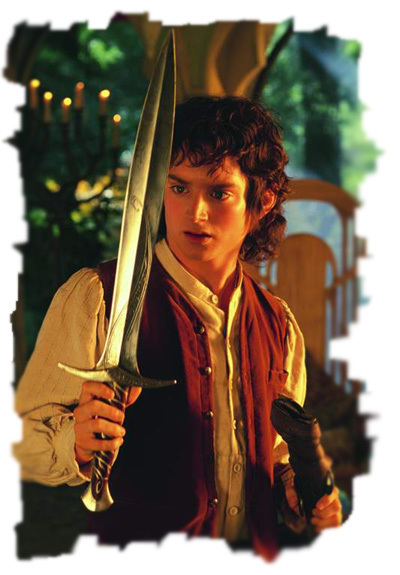 I'm not a collector of swords, but decided to purchase Sting ..
A magical sword given to Frodo Baggins by his uncle Bilbo, the original Ringbearer. It is up to Frodo and his trusty friend, Samwise, to cast the Ring back into the fires of Mount Doom from whence it came. 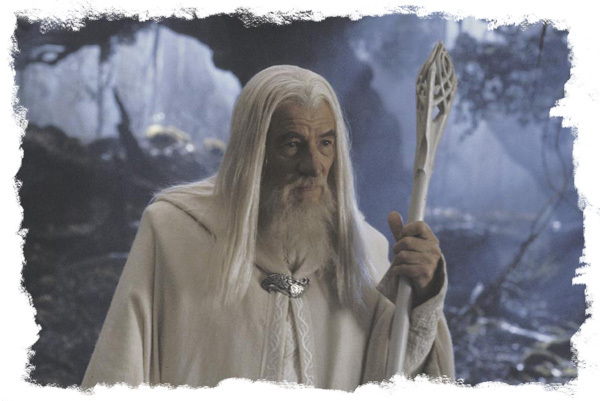 Bilbo gives Sting, a sword made by Elves in an age long past, to Frodo to serve him on his harrowing journey. 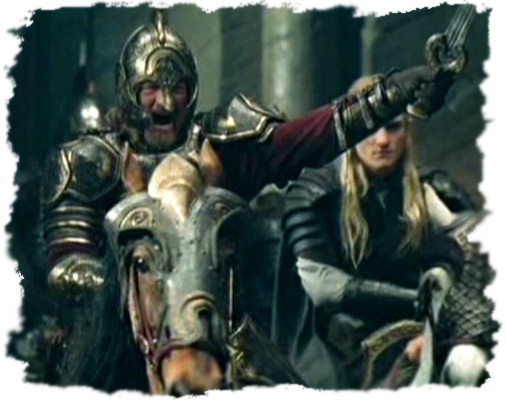 Bilbo carried Sting with him when he originally aquired the Ring from Gollum on his quest with the dwarves and Gandalf to the Lonely Mountain to defeat the dragon Smaug. Sting's blade glows blue when Orcs are near. Engraved on the blade and cross guard are runes in the Elven language of Sindarin that say "Maegnas aen estar nin dagnir in yngyl im" which translates to "Maegnas is my name, I am the spider's bane." This officially licensed replica of Sting comes with a wooden display plaque. Sting also includes an optional detailed genuine leather scabbard with embossed metal accents. Manufactured by United Cutlery. Sting is currently out of stock. 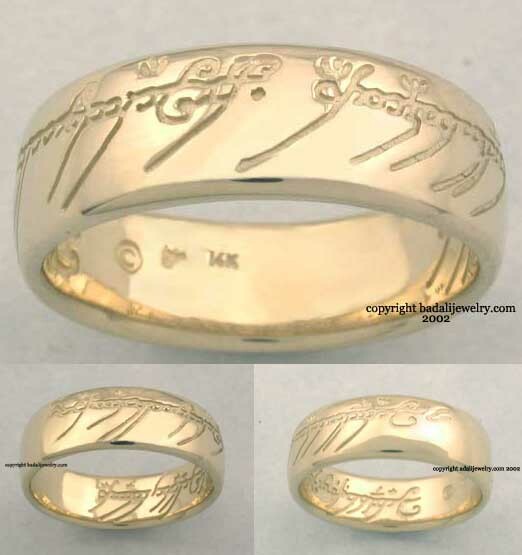 If you are working on a Frodo costume consider purchasing our Ring of Power reproduction. It also works well when displayed with Sting. Blade Material: Tempered, 420 J2 stainless steel. Etched with runes. Handle Material: Wood handgrip adorned with an Elven vine design, solid metal guard & pommel, rat-tail tang construction. Plaque: 9-3/16" x 11-3/8" x 3/4" wood, silkscreened, Elven design. This is a very beautiful sword. The sword is obviously very light due to its small size, and is great in terms of maneuverabilty. The constuction from hilt to sword is solid, and stable. And please, if you want full results from this sword, get the scabbard with it. It makes such a difference. .. If you are a fan of the films and a collector of Lord of the Rings then Sting should be first on your list! The elvist writing on the blade is extraordinary and the painted handle is extremely exquisit! 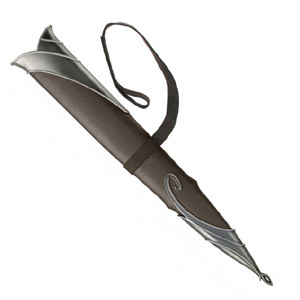 I also recommend the scabbard that increases the magic of this magnificant piece. Now all you need is to find and orc and maybe it will glow!!!.. Suilad! 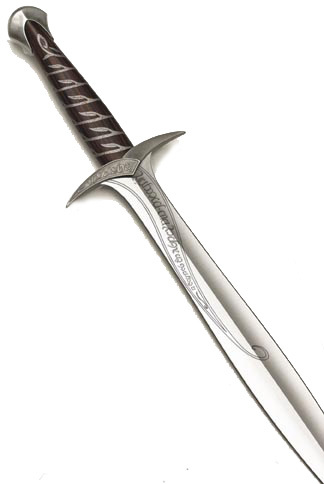 I have been the owner of Sting and its scabbard for a while, this being my first sword in my Lord of the Rings collection, and I will soon be recieving Anduril. This sword is an amazing reproduction of the movie swords. I love it! It looks especially nice in the scabbard, and both are quality peices of work. My only complaint is that it has a crack in the handel - I'm not sure whether it was like that before or not, but if it came like that, it isn't that important, at least to me. Also, the LOTR logo on the blade is quite annoying, but it just shows it's officially liscensed I geuss. Oh well. Yay! Sting! Lord of the Rings rocks! Go Tolkien and Pete. Random. "I think Elijah and I played about 4,000 hours of Sony Playstation.".. This sword is a MUST HAVE for any LOTR fan!!! It is AWESOME!! My runes on the blade of the display side aren't the best in the world, (etched a little "shaky") but it looks great on the wall. The scabbard is gorgeous, also! And how can you beat the price that CB Swords is offering?!? I'm already saving for my next purchase, but with their great prices, it won't have to be long!!! Glenn..
A MUST for any collector of LOTR weapon. Distinctive sound when it leaves the scabbard. I'm not a collector of swords, but decided to purchase Sting just because of my love for LOTR. I must say, the quality of the sword surpassed my hopes. The detail and workmanship is outstanding for the price! I'm hooked. This will be my first of many LOTR swords. Oh yeah, the scabbard is a must. Nice work, United Cutlery!.. I received this awesome sword only 3 days after it was shipped! It is very light and well-balanced, and the engravings are very clear. I also have Anduril, but i think i like this sword even more! ..
Sting is one of the most well made and great to look at at any time. Why get the scabbard becasue you can't see the sword! Great work United!.. I bought this sword to kick off my collection. 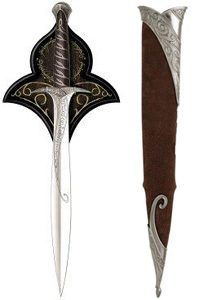 I've always been fascinated by swords, and this one is no exception. Even when i show people who aren't impressed by swords, they always have to hold this one!..